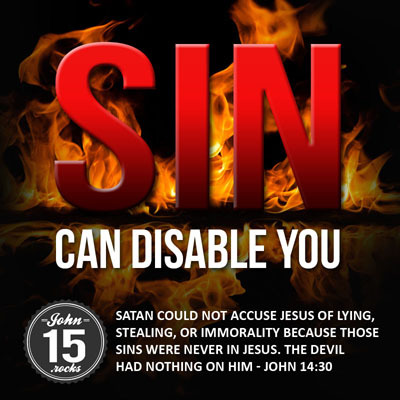 Sin can disable if you don't have Christ - John15 Rocks! 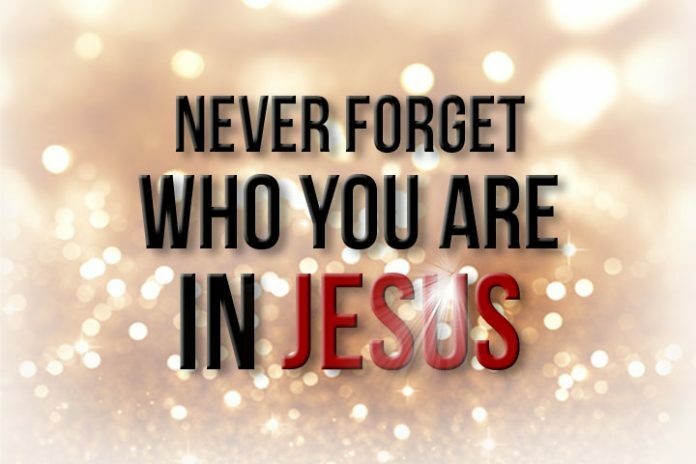 Jesus is God but He was also human who faced temptations as we do. However, Satan could not accuse Him of lying, stealing, or immorality because those sins were never in Jesus. The devil had nothing on him. (John 8:46; John 14:30). Unlike Jesus, if we fall into sin and not know who we are in Christ, we give the enemy a chance to disable us by having feelings of condemnation and inadequacy, even as a Christian. If we are fully submitted to the Lordship of Jesus, the devil too will have nothing on us. He is a defeated foe who can do nothing against us unless God gives him permission (Job 1:9–21; Job 2:6; Luke 22:31; 2 Corinthians 4:4-6; Mark 1:27). Even if we still sin and fall short, His love for us is sealed and endures forever (Ephesians 1:13-14). Those who belong to Christ are free from hell and condemnation (Romans 8:1). In the west, the disdain for sin has been replaced with “tolerant lifestyle,” others call it “choice.’ Many are desensitized with sin because their life seems pretty normal despite sexual immorality or a wanton life. For others, they are weakened by thoughts of condemnation and inadequacy because of sins they couldn’t get over with. They feel defeated. If you think you have been defeated by sin, what comes next is a defeated life. Joy disappears and you no longer want to go to church or pray. Your Christian life has lost its luster and you unknowingly accept the condemnation hurled at you. The negative thoughts and silent voices come from the enemy Satan, never from God. Sin can control you if you do not have the mind of Christ. Caveat: If we dwell and to an extent enjoy sin thinking God’s grace will abound, ask yourself if you truly are a follower of Christ (Hebrews 10:26). → Why do we get depressed? → How others twist the meaning of the Bible. We can acknowledge our sins before God, but it is worthy to note that our transgression no longer hinders our relationship with Him. In the Old Covenant, we were under the curse of the law, but in the New Covenant, the law no longer has the power to condemn us because of what Jesus did for us (Romans 6:14). → Share Jesus through one-verse evangelism or the “Bear Fruit” Gospel card. A new heart: God will put a new heart in you and remember your sins no more (Hebrews 8:12; Romans 6:18-22). No wonder the verse John 3:16 sound simple – salvation begins through a simple act of believing! → Do you have a secret sin that disqualifies you from serving God? Is Spiritual Deliverance and Warfare Biblical? Should you Name it, claim it?